As most legends go, this one started a long time ago and far away. 6,494 miles in fact. The year was 2004. Most know him as the “American Sniper” but his official job was a sniper for Charlie Platoon of SEAL Team 3. During the battle for Fallujah, Kyle and other snipers were assigned to provide support for Marine units assigned to take the city – house by house and block by block. Normally, these duties included leapfrogging with the ground assault teams by taking control of a building that offered good firing positions from which to cover the advancing Marines with long range rifle fire. One day, however, Kyle was literally on the ground with his Marines when they heard of another group of Marines pinned down by some serious insurgent resistance. With reports of trapped and wounded men, Kyle and the Marines with him immediately moved to aid and extract the stranded team. Just after providing cover fire so the pinned down group could return to safety, Kyle turned to make the run back himself, only to see one more Marine lying wounded in the street. In his words, this is what happened next. 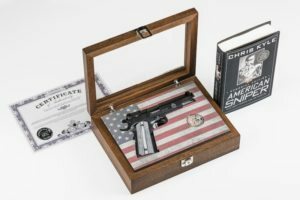 It’s in this spirit of toughness, commitment, and teamwork that Springfield Armory® decided to commemorate a true American Hero with a very special pistol. Back in 2015, Drew Herbst of Springfield Armory®, came up with the idea of building a limited edition pistol based on the 1911 TRP™ that Kyle chose to carry on that fateful day in Fallujah. After approaching Kyle’s widow, Taya, about the project, the decision was quickly made to design the project in a way that would directly benefit the Chris Kyle FROG Foundation and provide support to warriors, public servants, and their families. From that point, the project rolled. Springfield Armory® designed a very unique 1911 TRP™ pistol, the Legend Series, with a carefully chosen set of features that model some of the same attributes Kyle insisted on for his personal pistol. Early on, the decision was made to produce only 1,000 uniquely serialized pistols and package them in a commemorative mahogany display case that also features the serial number of the pistol. Each gun ships with a .999 pure silver Chris Kyle limited edition challenge coin and a Springfield Armory® certificate of authenticity. The final item in the special package is a copy of Chris’s book, American Sniper, personally autographed by Taya Kyle. And the gun itself? The Legend Series pistols feature five-inch stainless steel match grade barrels, low-profile three-dot Tritium combat sights, and black and gray G10 grips with an attractive American flag engraving. The frames and slides are forged carbon steel with Black Nitride treatment for durability and corrosion resistance. A National Match full-length guide rod rounds out the 8.6-inch long government model 1911. Each pistol ships with one seven-round stainless steel magazine with slam pad. If you want serial number CK0001, you’re out of luck. 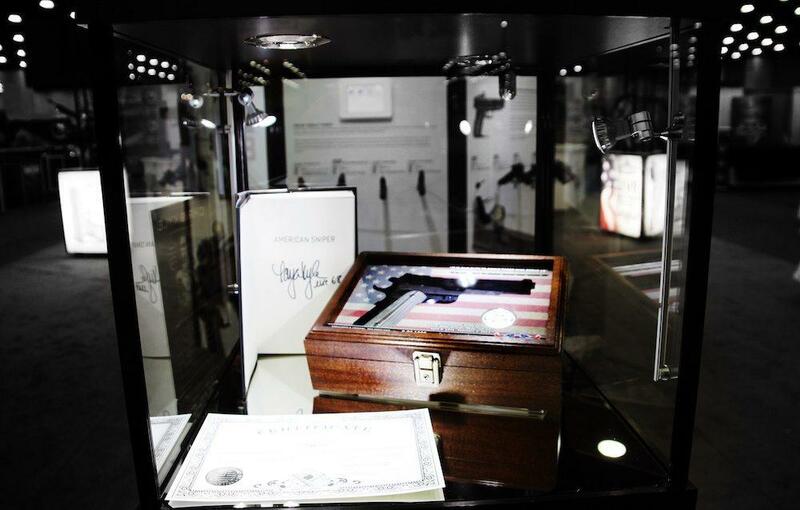 That pistol was given to Taya Kyle in a presentation during the 2016 SHOT Show as a token of appreciation for her tireless work in support of service members and in thanks for the sacrifices made by her and her husband, Chris in support of our country. Taya immediately gave up this gift, choosing to use it for a bigger and longer lasting purpose. On the spot, she announced her intention to auction this pistol as a fundraiser to benefit the Chris Kyle FROG Foundation. On May 1, the pistol auction went live on GunBroker.com and bids from generous supporters of the project quickly drove the price up to five figures. 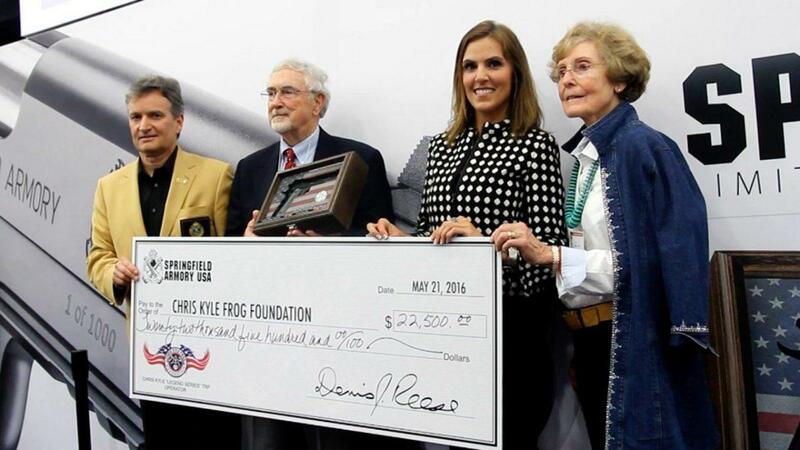 A live auction component opened in conjunction with the online auction from the Springfield Armory® booth during the 2016 National Rifle Association Annual Meeting in Louisville, KY.
A very generous NRA Life Member took home Legend number one with a closing bid of $22,500, all of which goes to the Chris Kyle FROG Foundation. The best news is that you can still get one. 999 Legend Pistols are being shipped soon to dealers across the country. Each package carries an MSRP of $2,495, with a portion of the proceeds from each gun benefitting the Chris Kyle FROG Foundation and the Chris Kyle Family. They’re rafting down the river but when they hit a rapid and the camera captures this? WOW!